Group bookings conditions: 30% deposit to confirm reservation. 70% payment one month before arrival. Welcome to the newest addition to Oasis Backpackers! Enjoy all the modern amenities that the contemporary world traveller could ever ask for free wifi access and computers, free security lockers, 24h service, cozy common areas, activities, a lively bar, and much, much more all located in the beautiful winding streets of Old Toledo and close to all the city´s most popular and significant sites. 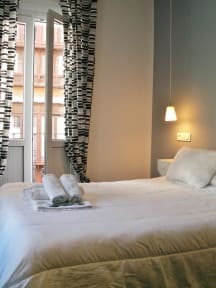 Oasis Backpackers' Toledo is a modern facility to give you, not just space to relax and recover from your travels, but also to give you the perfect base from which to explore this beautiful city. Toledo is magnificently mirrored in the waters of the Tagus River which encircles the historic city centre, where must-see sites like the Cathedral and the Iglesia de los Jesuitas wait just a minutes walk from the comfort of your Oasis Hostel. Choose from charming four ensuite dorms, comfy ensuite twin rooms all with heavenly mattresses, fresh clean linens, and warm blankets. Looking for some alone time? Luxurious private double-bed rooms, each one complete with personal bathrooms offering hot, high-pressure showers set allow for some private peace and quiet. Ask our amazing Oasis Backpackers' Toledo staff members about the city, get local insider tips from us that guide books just can`t offer, and see the city like a local! At Oasis Hostel, we want you to experience true Toledo, so take your time exploring with the knowledge that Oasis Hostel staff members are here to help you whenever you need. Take a break and enjoy our common areas, terrace, or the spirited bar downstairs, meet your fellow travellers and swap stories. After dinner and drinks at Oasis Backpackers' Toledo, join us for a night out in the town, dropping into great local bars and clubs, and enjoying tasty local cocktails. And if you`d rather spend a night in, sink into our thick mattresses and warm blankets, take a refreshing shower under high pressure faucets with never-ending hot water, or curl up in the lounge and recharge your batteries. Whatever your game plan may be, Oasis Hostel has got you covered. So stay, relax, and enjoy. Please advise your time of arrival. Credit cards payment accepted upon arrival. Great location, staff is friendly and helpful, amazing rooftop views. Definitely recommend. The Oasis kitchen is on the 4th floor, the top floor and it has amazing 360 degree views of Toledo. It’s great relaxing up there, in the sunshine enjoying the views. The rooms have lockers, clean bathrooms and the staff are all great! This is one of the best hostels I’ve ever visited. Located in the heart of Toledo, it is the perfect location to explore. The staff was extremely knowledgeable and friendly. The room was very clean and comfortable, as was the bathroom. One of the best parts of the hostel is the view from the rooftop patio. 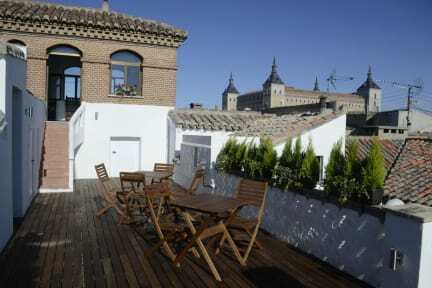 A great hostel, with great location right in the heart of Toledo. The staff was really helpful in helping me navigate this city that reminded me of the game assassins creed. The view was amazing from the roof top, the coffee shop next door was my go to place for breakfast and normally lunch. The only thing the hostel lacked was social activities which made the trip a bit dull. Thankfully the staff were friendly enough to socialise with. The rooms are beautiful, the staff are really nice and helpful, the hostel is in a perfect location. Definitely will come back! Friendly staff and central location, important because Toledo is on a massive hill. Not a ton of opportunities for other travelers to cross paths. Simple facilities. Gorgeous terrace space can potentially provide that. No breakfast options but it’s attached to a wonderful affordable cafe that’s open till 13:00. Super central location with a beautiful rooftop! Not much of a social vibe but the beds are super comfy and the staff is nice. This hostel is good for anyone who is looking for a place to sleep in a good location. If you’re looking for an atmosphere to meet people and make friends this isn’t really the place. However, everything was clean, and the staff was very nice and helpful. The hostel was okay, it’s definitely dated. If you get a bottom bunk, you can’t sit up in your bed. The kitchen is above the rooftop terrace, and was always full of flies when I was up there. I’m glad I was only here for one night. If you’re looking for somewhere to just sleep for the night, it’s fine, but if you’re planning on spending a few days in Toledo, I’d find somewhere a bit nicer.